BestDuplicator is committed to providing you the newest and latest technologies at the best possible price in the market. With our all new Duplicator series we differ from our competitors with our advanced parts. As usual our duplicators all contain 128 MB Buffer Controllers which many other brands only have 64 MB Buffer. The Duplicator's Burners all contain the brand new 16X Blu-ray Burners compared to the old 12X and 15X Blu-ray Burners. While our Disc Burning speeds have improved, we are pleased to announce that our Blu-Ray Duplicators now support M-Disc. You will not have to worry about buying a different Duplicator or Burner if you need the drives to support M-Disc. Our Hierarch status of Disc Compatibility remains as our new models now supports more discs as before. The user friendly LCD interface provides a simple one step copy function that burns your DVD blank discs at an optimal speed producing 1 15 (depends on your of Targets on your duplicator)copies every burn cycle. Burning speeds are adjustable and other standard menu features are available as more advanced features. A computer or external device is not required at all to use the unit. 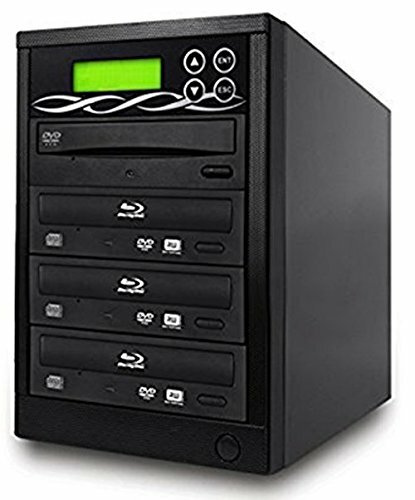 Inside this copy tower, different CD and DVD formats are automatically detected to allow stable and secure buffer speeds while under run protected burning without the added trouble or stress from a computer to handle such functions. Supports BD-R/M-Disc/DVD+/-R, DVD+/-RW, DVD+/-R Dual Layer, CD-R, CD-RW blank media standards.1 slot is meant for the original CD/DVD and the 3 remaining slots are for the blank CD's/DVD's being burned, which makes this unit a "3 target"
Intelligent design automatically recognizes the source disc format. New 16X Blu-Ray Burners, 128MB Controller, Fully stand-alone system - No computer needed! If you have any questions about this product by BestDuplicator, contact us by completing and submitting the form below. If you are looking for a specif part number, please include it with your message.